A lot is written about the frustrating advances of recruiters and much of the criticism is deserved. It goes both ways: the LinkedIn connection request is nuanced and problematic. This is both a design and user behaviour issue. If we can make the value of us connecting more obvious, I would be thrilled to do so. I'm on social networks partly to make new connections. However, the whole experience could be a lot less awkward. It's analogous to Hunter Walk's comment on messaging platform integration: "Communication is about permissions, not email addresses, phone numbers or addresses." Adding LinkedIn to that list, discovery is easy but engagement is effort. That's not going to cut it for the following reasons. To help navigate design limitations and personal expectations, I suggest a LinkedIn philosophy (balanced with healthy online security practices and social networking courtesies). When I talk to professionals who are building the confidence with LinkedIn, they're often anxious about the cultural norms of connection requests. The number one question I get is, “I don't know this person; if I ignore them, will they get a notification?” (no, as at March 2017). LinkedIn "strongly recommend that you only accept invitations to connect from people you know.” Realistically, we're all searching for opportunities (jobs, talent, business development, influence) through access to and insight from people beyond our immediate social graph. If I don't know you but you have two of these qualifiers, I'll most likely accept. If you have one, I'll think about it. Of course, how you engage on a social platform is an entirely personal choice that hopefully achieves the benefits you expect. No photo is a deal-breaker though. According to Hari Srinivasan, Head of Identity Products at LinkedIn, the January 2017 UX design mirrors an introduction at a conference or meeting. Photos increase profile views by 21 times and users receive nine times more connection requests. Occasionally, I'll relax my criteria and find that either the quality of content in my newsfeed drops or my inbox is spammed. While I can unfollow users in my feed but remain connected, spamming and similar behaviour usually encourages me to remove the contact with the confidence that I gave them a fair chance. So, what about LION users? It's a common tactic though the term is not endorsed by LinkedIn. The requests I get from LIONs typically don't fulfil my three criteria. Those that I've taken a chance on, I've never heard from again after accepting a connection request. It doesn't feel like there is mutual value there for us. They get to expand their secondary network for free. Whereas, I question the quality of their network plus I'm already paying for a premium subscription that gives me expanded search functionality of secondary and tertiary connections. Some recruiters might balk at this. Why would I ever decline any in-bound connection? "Today's business analyst is tomorrow's CEO!" Well, maybe. Part of my professional value is the quality of network that I carefully curate. I'm just suggesting a quick verification of invitations. I wouldn't expect to go to a networking event and have a business card thrown at me like a shuriken without so much as a handshake. I enjoy the product most when the experience adds value to my work. For me, that's following influencers and trends, being accessible to valuable contacts, identifying top talent and amplifying personal brand. I'm open; that's why I'm on the platform. If the medium is the message, let's connect better on LinkedIn. 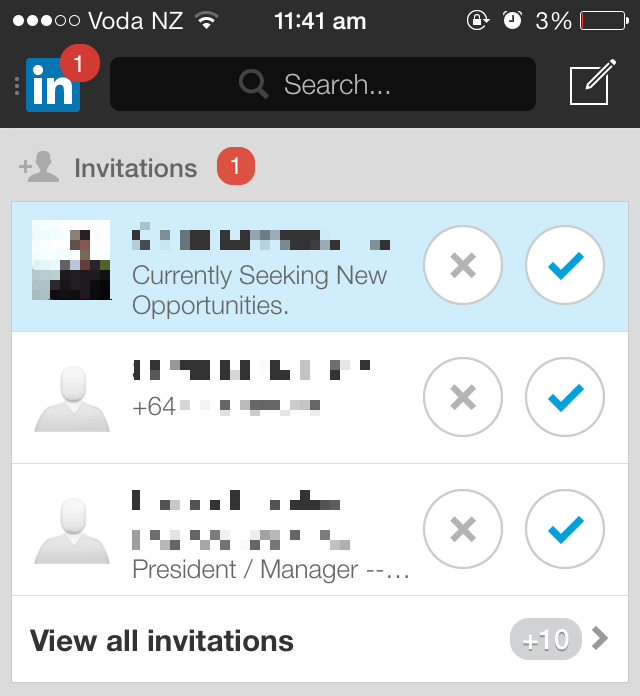 How do you manage LinkedIn invitations? I'd love to hear about your experience. I write about people, culture and music. Subscribe to get my new posts via email.